The long-awaited National Pengyou Day is finally approaching! The Project Pengyou team at UT is inviting all students and faculty to this night of U.S.-China relation-building and cultural exchange. 1. 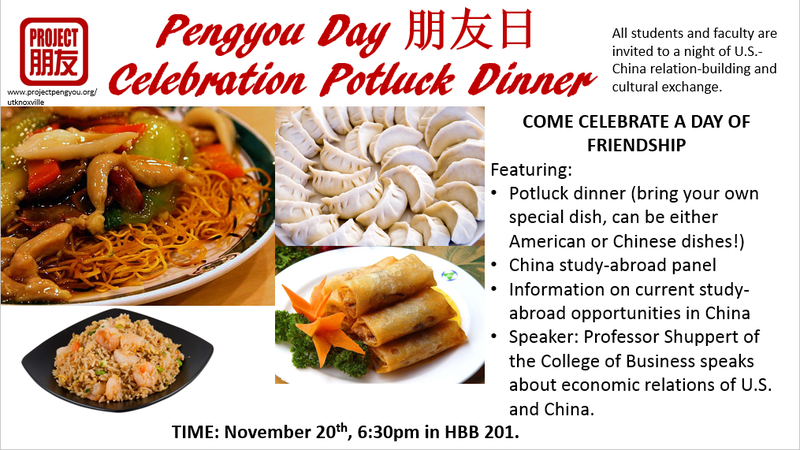 Potluck dinner (bring your own special dish, can be either American or Chinese dishes)! 3. Information on current study-aboard opportunities in China. 4. Speaker Panel: Professor Shuppert of the Haslam College of Business will be presenting the current economic relations of U.S. and China. All you need to bring is your curiosity and knowledge about China, plus a simple dish, and we will promise you a night full of fun, laughter, new perspectives, as well as friendships! Please RSVP if you would like to attend as this would help us to better prepare for the event!